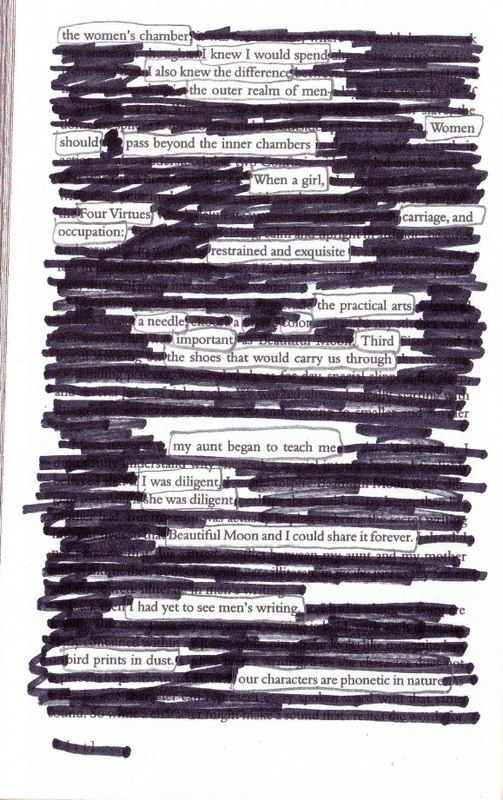 Erasure poems are a type of found poems that utilize words from an existing text to create a brand new poem. Typically the author will take an eraser or a black marker and cross out the words they do not wish to keep to then create a poem with what is left on the page. Visually they can be pieces of art or simply look like a traditional poem on page. One of the earliest and most noteworthy erasure poems, “Radi Os” by Ronald Johnson,uses the text from Milton’s Paradise Lost. Since then, erasure poetry has evolved quite significantly and can be made from literally any piece of text, be they poems, twitter feeds, biographies, articles, the list is endless. Notice how the poem takes on a whole new meaning when reworked into a single stanza verse. There seems to be a clearer, different narrative, and the repetition brings a musical element to the poem. As I reworked this particular erasure, I found the poem tried to capture a whole new element of the text while being able to stand alone as its own poem. I tried to capture the essence of the original text, but I did not feel obligated to do so. It is a magical thing that happens when you write an erasure poetry: things just fall into place. The language births a new meaning and a brand new poem is brought into the world. This is what makes erasure poetry so great; it finds new meaning in the original source text rather than completely steer away from it entirely. The erasure movement is becoming more and more dominant in the world of poetry. Wave Books offers a number of source texts and erasure poems. Geist, a Canadian literary magazine of ideas and culture, offers an annual erasure contest. The point is, the possibilities are endless! For more insight on erasure poetry, check out a podcast from the Poetry Foundation. Tags: erasure poerty, erasures. Bookmark the permalink.